Kelly had her meeting with the “Escalation Committee” at AT&T. Result: Good-bye AT&T…come Tuesday…Hello Comcast! It is Spring time. More little insects are crawling around…including in your house maybe?.. If so, let me recommend 3-B Pest Control. (You can find them in the Michiana Yellow Pages) Jim is the man! We use them at the church and he came out and sprayed my house yesterday. The dude is awesome. Anyone have any critters roaming around the house? We started to get those massive ants that look like the size of dogs! Jason Castro – Song #1 – A little better than OK…I’m still for you…Forever in Blue Jeans (I happen to be wearing a pair right now! Coincidence…I don’t think so!!! ); Song #2 – “Another just OK”…I agree with that. David Cook– Song #1 – OK…seemed a little too guttural for me (seemed too much like a Neil Diamond wannabe rather than just being himself singing Neil Diamond); Song #2 – His half open eyes get on my nerves after awhile…just fall asleep already (I know I’m being picky). Second song better. Brooke White– Song #1 – ohhh…that was bad…wrong key…WAY TOO low…now I’m not sure I believe (get it? she sang I’m a Believer). “That was her worst ever.” – Kelly Barrington “Yikes” – Isaac Barrington (and Julliard School of Music Student); Song #2 – (she wrote the lyric on her hand?!) I liked it…very good! Stay there Brooke that is where you belong. David Arculeta – Song #1 – I heard this same song (and just as good) on a cruise ship karaoke night just a few months ago. 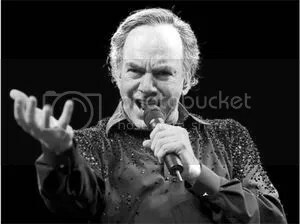 ; Song #2 – (This is my favorite Neil Diamond song) Way too smooth (and I don’t mean that positively) and too many runs and vibrato…come on dude…this is Neil Diamond!!! This is like a High School class choir presentation. Syesha Mercado – Song #1 – (Hello Again…oh…a classic) I wasn’t wowed. A few high notes seemed wrong. Where are her shoes? ; Song #2 – boring. Simon got it EXACTLY right after the first round! The second week of our Ancient/Future Faith series is now on-line. This week’s message is on the long tradition of communion. You can find the message here. I have serious yard work to do today. I hate yard work! Everyone around me has raked, mowed, etc. To avoid code enforcement I should probably take care of my yard today. For a professing Christian to manipulate and denigrate the Holy Scriptures is apostate in character. When what is apostate in character seeks the most powerful office in the Western World, it is the duty of Christians everywhere to sound the alarm! I’m not a Barack Obama supporter. I’m not a Barack Obama hater either. But why is this ALL about Barack Obama. Has anyone asked about Hillary Clinton’s views? What about John McCains? “Apostate”?! Is Barack running for Pope, for Bishop, for some religious office? Do you know what Thomas Jefferson did to the Bible? Has anyone ever heard of the Jeffersonian Bible? He didn’t believe in the possibility of miracles, so he literally cut them out of his Bible. Many of the earliest founding fathers of our country were Deists who would hold “apostate” views of Scripture in the eyes of many and yet we celebrate them as some of the great leaders of our country’s history. If “Concerned Christians” don’t want to vote for Barack Obama because of his interpretive views of Scripture, then by all means…don’t vote for him…but please don’t contend it is the “duty of Christians everywhere to sound the alarm!” The alarm of what?! Barack doesn’t see the Bible like I do. Man!! Had no internet at the house or at the church (we use AT&T…for now….keep reading) and according to the paper this morning, someone tried to steal some scrap metal and ended up cutting out internet service to the AT&T internet subscribers in South Bend and surrounding area. NO internet from about 2:00 p.m until (who knows when)…but at least back on by 5:30 a.m. this morning! Speaking of AT&T…we use them at the house for internet, phone, TV, etc. We have a horrific story of our experience with AT&T. Seriously…it has brought my wife to tears (and she is like Zena, Warrior Princess tough). It was so bad that yesterday an AT&T employee at the business office agreed that we have been treated so badly by the company that she arranged a meeting with my wife with their “Escalation Committee” by phone today. What an “Escalation Committee” is…I have no idea…but it sounds serious. So…we’ll see how this ends. Needless to say…our experience with AT&T thus far as been HORRIFIC!!! Maybe today that will change.